To get admission in good college students have to secure more marks and have to grab good rank. 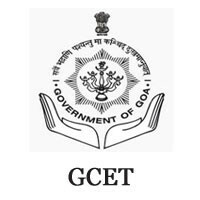 To get good rank in GCET 2019 candidate have to study all the topics given in the syllabus. The GCET 2019 syllabus prepared by DTE for the exam. UNIT I: ELECTROSTATICS: Electric charges and their conservation. Coulomb’s law, the force between two point charges, forces between multiple charges; superposition principle and continuous charge distribution. The electric field, electric field due to a point charge, electric field lines; electric dipole, electric field due to a dipole; torque on a dipole in a uniform electric field. Electric flux, statement of Gauss’s theorem and its applications to find field due to the infinitely long straight wire, uniformly charged infinite plane sheet and uniformly charged thin spherical shell (field inside and outside). Electric potential, potential difference, electric potential due to a point charge, a dipole and system of charges; equipotential surfaces, electrical potential energy of a system of two point charges and of electric dipoles in an electrostatic field.Conductors and insulators, free charges and bound charges inside a conductor. Dielectrics and electric polarisation, capacitors and capacitance, the combination of capacitors in series and in parallel, the capacitance of a parallel plate capacitor with and without dielectric medium between the plates, energy stored in a capacitor, Van de Graaff generator. UNIT II: CURRENT ELECTRICITY: Electric current, the flow of electric charges in a metallic conductor, drift velocity and mobility, and their relation with electric current; Ohm’s law, electrical resistance, V-I characteristics (linear and non-linear), electrical energy and power, electrical resistivity and conductivity. Carbon resistors, the color code for carbon resistors; series and parallel combinations of resistors; temperature dependence of resistance. The internal resistance of a cell, potential difference and emf of a cell, combination of cells in series and in parallel. Kirchhoff ’s laws and simple applications. Wheatstone bridge, meter bridge. Potentiometer – principle and applications to measure potential difference, and for comparing emf of two cells; measurement of internal resistance of a cell. UNIT III: MAGNETIC EFFECTS OF CURRENT AND MAGNETISM: Concept of magnetic field, Oersted’s experiment. Biot - Savart law and its application to current carrying circular loop. Ampere’s law and its applications to infinitely long straight wire, straight and toroidal solenoids. Force on a moving charge in uniform magnetic and electric fields. Alternating Current; frequency of AC, advantages of AC over DC. Cyclotron. Force on a current-carrying conductor in a uniform magnetic field. The force between two parallel current-carrying conductors – definition of ampere. Torque experienced by a current loop in a magnetic field; moving coil galvanometer – its current sensitivity and conversion to ammeter and voltmeter. Current loop as a magnetic dipole and its magnetic dipole moment. The magnetic dipole moment of a revolving electron. Magnetic field intensity due to a magnetic dipole (bar magnet) along its axis and perpendicular to its axis. Torque on a magnetic dipole (bar magnet) in a uniform magnetic field; bar magnet as an equivalent solenoid, field due to a current carrying conductor, field due to current carrying coil, magnetic field lines; Earth’s magnetic field and magnetic elements. Para-, dia- and ferromagnetic substances, with examples. Electromagnets and factors affecting their strengths. Permanent magnets. UNIT IV: ELECTROMAGNETIC INDUCTION AND ALTERNATING CURRENTS: Electromagnetic induction; Faraday’s law, induced emf and current; Lenz’s Law, Eddy currents. Self and mutual inductance.Alternating currents, peak and RMS value of alternating current/voltage; reactance and impedance; LC oscillations (qualitative treatment only), LCR series circuit, resonance; power in AC circuits, wattless current. AC generator and transformer. UNIT V: ELECTROMAGNETIC WAVES: Idea of displacement current. Electromagnetic waves and their characteristics (qualitative ideas only). Transverse nature of electromagnetic waves. Electromagnetic spectrum (radio waves, microwaves, infrared, visible, ultraviolet, x-rays, gamma rays) including elementary facts about their uses. UNIT VI: OPTICS: Reflection of light, spherical mirrors, mirror formula. Refraction of light, total internal reflection and its applications, optical fibers, refraction at spherical surfaces, lenses, thin lens formula, lens- maker’s formula.Magnification, the power of a lens, a combination of thin lenses in contact combination of a lens and a mirror. Refraction and dispersion of light through a prism. Scattering of light – blue color of the sky and reddish appearance of the sun at sunrise and sunset. Optical instruments: Human eye, image formation and accommodation, correction of eye defects (myopia and hypermetropia) using lenses. Microscopes and astronomical telescopes (reflecting and refracting) and their magnifying powers. Wave optics: Wavefront and Huygens’ principle, reflection and refraction of plane wave at a plane surface using wave fronts. Proof of laws of reflection and refraction using Huygens’ principle. Interference, Young’s double hole experiment and expression for fringe width, coherent sources and sustained interference of light. Diffraction due to a single slit, width of central maximum. Resolving power of microscopes and astronomical telescopes. Polarisation, plane polarised light; Brewster’s law, uses of plane polarised light and Polaroids. UNIT VIII: ATOMS AND NUCLEI: Alpha - particle scattering experiment; Rutherford’s model of atom; Bohr model, energy levels, hydrogen spectrum. Composition and size of the nucleus, atomic masses, isotopes, isobars; isotones. Radioactivity-alpha, beta and gamma particles/rays and their properties; radioactive decay law. Mass-energy relation, mass defect; binding energy per nucleon and its variation with mass number; nuclear fission and fusion. UNIT IX: ELECTRONIC DEVICES: Energy bands in solids (qualitative ideas only), conductors, insulators and semiconductors; semiconductor diode – I-V characteristics in forward and reverse bias, diode as a rectifier; I-V characteristics of LED, photodiode, solar cell, and Zener diode; Zener diode as a voltage regulator. Junction transistor, transistor action, characteristics of a transistor; transistor as an amplifier (common emitter configuration) and oscillator. Logic gates (OR, AND, NOT, NAND and NOR). The transistor as a switch. UNIT X: COMMUNICATION SYSTEMS: Elements of a communication system (block diagram only); bandwidth of signals (speech, TV and digital data); bandwidth of transmission medium. Propagation of electromagnetic waves in the atmosphere, sky and space wave propagation. Need for modulation. Production and detection of an amplitude-modulated wave. Books: Published by Goa Board of Secondary and Higher Secondary Education. UNIT I: SOLID STATE: Classification of solids based on different binding forces :molecular, ionic covalent and metallic solids, amorphous and crystalline solids(elementary idea),unit cell in two dimensional and three dimensional lattices, calculation of density of unit cell, packing in solids, packing efficiency, voids ,number of atoms per unit cell in a cubic unit cell, point defects, electrical and magnetic properties, Band theory of metals ,conductors, semiconductors and insulators and n and p-type semiconductors . UNIT II: SOLUTIONS: Types of solutions, expression of concentration of solutions of solids in liquids, solubility of gases in liquids, solid solutions, colligative properties – relative lowering of vapour pressure, Raoult’s law , elevation of B.P., depression of freezing point, osmotic pressure, determination of molecular masses using colligative properties, abnormal molecular mass, Vant Hoff factor. UNIT III: ELECTROCHEMISTRY:Redox reactions; conductance in electrolytic solutions, specific and molar conductivity variations of conductivity with concentration, Kohlrausch’s Law, electrolysis and laws of electrolysis (elementary idea), dry cell – electrolytic cells and Galvanic cells; lead accumulator, EMF of a cell, standard electrode potential, Nernst equation and its application to chemical cells. The relation between Gibbs energy change and EMF of a cell, fuel cells; corrosion. UNIT IV: CHEMICAL KINETICS: Rate of a reaction (average and instantaneous), factors affecting rates of reaction: concentration, temperature, catalyst; order and molecularity of a reaction; rate law and specific rate constant,integrated rate equations and half life (only for zero and first order reactions); concept of collision theory (elementary idea, no mathematical treatment).Activation energy, Arrhenius equation. UNIT V: SURFACE CHEMISTRY:Adsorption – physisorption and chemisorption; factors affecting adsorption of gases on solids; catalysis: homogenous and heterogeneous, activity and selectivity: enzyme catalysis; colloidal state: distinction between true solutions, colloids and suspensions; lyophilic, lyophobic multimolecular and macromolecular colloids; properties of colloids; Tyndall effect, Brownian movement, electrophoresis, coagulation; emulsions – types of emulsions. UNIT VI: GENERAL PRINCIPLES AND PROCESSES OF ISOLATION OF ELEMENTS: Principles and methods of extraction – concentration, oxidation, reduction electrolytic method, and refining; occurrence and principles of extraction of aluminium, copper, zinc and iron. UNIT VII: P-BLOCK ELEMENTS: Group 15 elements: General introduction, electronic configuration, occurrence, oxidation states, trends in physical and chemical properties; nitrogen – preparation, properties and uses; compounds of nitrogen: preparation and properties of ammonia and nitric acid, oxides of nitrogen ( structure only); Phosphorous-allotropic forms; compounds of phosphorous: preparation and properties of phosphine, halides (PCl3 , PCl5 ) and oxoacids (elementary idea only). Group 16 elements: General introduction, electronic configuration, oxidation states, occurrence, trends in physical and chemical properties; dioxygen: preparation, properties and uses; classification of oxides; ozone. Sulfur – allotropic forms; compounds of sulfur: preparation, properties and uses of sulfur dioxide; sulphuric acid: industrial process of manufacture, properties, and uses, oxoacids of sulfur (structures only). Group 17 elements: General introduction, electronic configuration, oxidation states, occurrence, trends in physical and chemical properties; compounds of halogens: preparation, properties and uses of chlorine and hydrochloric acid, interhalogen compounds, oxoacids of halogens (structures only).Group 18 elements: General introduction, electronic configuration, occurrence, trends in physical and chemical properties, uses. UNIT IX: COORDINATION COMPOUNDS: Coordination compounds : Introduction, ligands, coordination number, colour, magnetic properties and shapes, IUPAC nomenclature of mononuclear coordination compounds, bonding, Werner’s theory VBT,CFT; isomerism (structural and stereo)importance of coordination compounds (in qualitative analysis, extraction of metals and biological systems). UNIT X: HALOALKANES AND HALOARENES: Haloalkanes: Nomenclature, nature of the C-X bond, physical and chemical properties, mechanism of substitution reactions. Optical rotation. Haloarenes: Nature of C-X bond, substitution reactions (directive influence of halogen for monosubstituted compounds only). Uses and environmental effects of – dichloromethane, trichloromethane, tetrachloromethane, iodoform, freons, DDT. UNIT XI: ALCOHOLS, PHENOLS, AND ETHERS: Alcohols: Nomenclature, methods of preparation, physical and chemical properties (of primary alcohols only); identification of primary, secondary and tertiary alcohols; mechanism of dehydration, uses, with special reference to methanol and ethanol. Phenols: Nomenclature, methods of preparation, physical and chemical properties, acidic nature of phenol, electrophilic substitution reactions, uses of phenols. Ethers: Nomenclature, methods of preparation, physical and chemical properties, uses. UNIT XII: ALDEHYDES, KETONES AND CARBOXYLIC ACIDS: Aldehydes and Ketones: Nomenclature, nature of carbonyl group, methods of preparation, physical and chemical properties, and mechanism of nucleophilic addition, the reactivity of alpha hydrogen in aldehydes; uses.Carboxylic Acids: Nomenclature, acidic nature, methods of preparation, physical and chemical properties; uses. UNIT XV: POLYMERS: Classification – Natural and synthetic, methods of polymerization (addition and condensation), copolymerization. Some important polymers: natural and synthetic like polythene, nylon, polyesters, bakelite, rubber. Biodegradable and non-biodegradable polymers. UNIT XVI: CHEMISTRY IN EVERYDAY LIFE: Chemicals in medicines – analgesics, tranquillizers, antiseptics, disinfectants, antimicrobials, antifertility drugs, antibiotics, antacids, antihistamines. Chemicals in food – preservatives, artificial sweetening agents, elementary idea of antioxidants. Cleansing agents – soaps and detergents, cleansing action. UNIT I: RELATIONS AND FUNCTIONS: Relations and Functions Types of relations: Reflexive, symmetric, transitive and equivalence relations. One to one and onto functions, composite functions, the inverse of a function. Binary operations. Inverse Trigonometric Functions Definition, range, domain, principal value branches. Graphs of inverse trigonometric functions. Elementary properties of inverse trigonometric functions. UNIT II: ALGEBRA: Matrices Concept, notation, order, equality, types of matrices, zero matrices, the transpose of a matrix, symmetric and skew-symmetric matrices. Addition, multiplication and scalar multiplication of matrices, simple properties of addition, multiplication and scalar multiplication. Non-commutativity of multiplication of matrices and existence of non-zero matrices whose product is the zero matrix (restrict to square matrices of order 2). The concept of elementary row and column operations. Invertible matrices and proof of the uniqueness of inverse, if it exists; (Here all matrices will have real entries). Determinants Determinant of a square matrix (up to 3 × 3 matrices), properties of determinants, minors, cofactors and applications of determinants in finding the area of a triangle. Adjoint and inverse of a square matrix. Consistency, inconsistency and number of solutions of the system of linear equations by examples, solving system of linear equations in two or three variables (having a unique solution) using the inverse of a matrix. UNIT IV: VECTORS AND THREE-DIMENSIONAL GEOMETRY: Vectors and scalars, magnitude and direction of a vector. Direction cosines/ratios of vectors. Types of vectors (equal, unit, zero, parallel and coplanar vectors), position vector of a point, negative of a vector, components of a vector, the addition of vectors, multiplication of a vector by a scalar, position vector of a point dividing a line segment in a given ratio. Scalar (dot) product of vectors, the projection of a vector on a line. Vector (cross) product of vectors, scalar triple product. Three-dimensional Geometry Direction cosines/ratios of a line joining two points. Cartesian and vector equation of a line, coplanar and skew lines, the shortest distance between two lines. Cartesian and vector equation of a plane. The angle between (i) two lines, (ii) two planes, (iii) a line and a plane. The distance of a point from a plane. UNIT V: LINEAR PROGRAMMING: Introduction, related terminology such as constraints, objective function, optimization, different types of linear programming (L.P.) problems, mathematical formulation of L.P. problems, graphical method of solution for problems in two variables, feasible and infeasible regions, feasible and infeasible solutions, optimal feasible solutions (up to three non-trivial constraints). UNIT VI: PROBABILITY: Multiplication theorem on probability. Conditional probability, independent events, total probability, Baye’s theorem. Random variable and its probability distribution, mean and variance of the haphazard variable. Repeated independent (Bernoulli) trials and Binomial distribution. Note: To know best books to study the syllabus refer Reference Books. What topics do we need to follow in chemistry for GCET exam? Hi Afreen, chemistry include many topics in it which are important some are solid state, solutions, chemical kinetics and much more others. Have a look at the details and the topics in the Syllabus of GCET. What is the physics topics for GCET exam? Hi Nihal, topics which are most relevant and from which questions will be asked in GCET exam are electrostatics, current electricity and many more about which you can have a look at the Syllabus of GCET.